Why do both new and pre-owned Honda CR-V’s continue to be popular choices with drivers? CR-V’s are excellent examples of Honda’s dedication to building vehicles that are dependable, perform well, and are comfortable to drive. 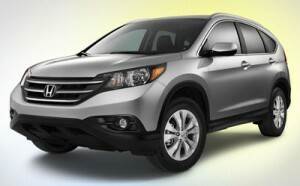 The 2013 Honda CR-V lives up to Honda’s reputation for quality, as well as sporting an innovative design and a large list of features. Families interested in a crossover vehicle may also consider the 2013 Kia Sportage. And while the Sportage has similar priced options to the CR-V it misses out on many of the aspects that Honda drivers are enjoying, including ample cargo space. Here’s how the two vehicles match up. There is also a big difference between the cargo capacities on the two models. Crossovers like the CR-V are meant to be versatile vehicles, so plenty of cargo room is important. While the CR-V has 37.1 cubic feet of cargo space, the Sportage only has 26.1 cubic feet. With the seats folded down, the CR-V’s cargo capacity is increased to 70.9 cubic feet. With a similar cargo configuration, the Sportage still trails behind with 54.6 cubic-feet. In order to make up your mind, you have to see the Honda CR-V in person. If you’d like to take the CR-V out for a spin, we encourage you to stop by our dealership for a test drive. We’d be happy to tell you about the different options available for the CR-V, as well as pricing. Our dealership is located at 520 Route 211, in Middletown, just a short five-minute drive from Mechanicstown, New York by taking Schutt Road and NY-211 East. We’re next to Gander Mountain and across the street from Manju’s Beauty Palace. If you have any questions, please contact the dealership.